Discovering breakthroughs in modular energy system technology. "Easy Energy Systems’ mission to innovate and bring new solutions and technologies to market is helping to reduce our carbon footprint for future generations..."
Innovations w/Ed Begley Jr. will explore recent advancements in sustainable energy in an upcoming episode, airing 3rd QTR 2018 on FOX Business. Check your local listings for more information. In this episode, Innovations will feature Easy Energy Systems, Inc. (EES), a company dedicated to producing new solutions that will reduce dependency on fossil fuels, reduce pollution, and improve the lives of people throughout the world. 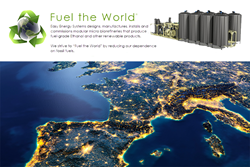 With the goal to become the world’s leader in developing systems for sustainable, advanced biofuel production, Easy Energy Systems, Inc. (EES) is passionate about providing dynamic modular solutions to our world's energy problems. With this common purpose EES is building an ecosystem of the best people, partners, and customers to bring forth innovative technologies that will produce high-quality and efficient biofuels, valuable biochemicals, adhesives, fertilizers, animal feed and more. For more information, visit: http://www.easyenergysystems.com. Backed by experts in various fields, and a team dedicated to education and advancement, DMG Productions consistently produces commercial-free, educational programming on which both viewers and networks depend. For more information visit http://www.InnovationsTelevision.com or call (866) 496-4065.